photo from msnb.,msn.com. The community of South Central has been struck with another painful blow, in a part of town already plagued by crime, poverty, and violence. 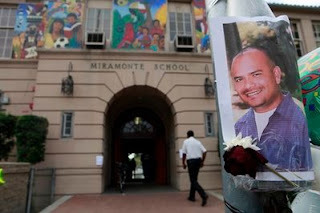 This week, a teacher, a respected and integral part of the Miramonte community took his own life, due to pressure faced about his public job rating, according to family members. Today, the CA Department of Education released the Accountability reports for schools throughout the state. Although LAAMS had received its raw scores in August, the API score released today is significant because it measures how our school has been performing over time. 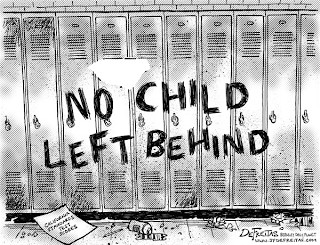 After many years of positive growth, this last school year did not produce continued growth. We went down by 5 points in the API measure. This score is bittersweet. We have an organized and efficient campus, one that many families flock to, and one that takes pride in serving the community. 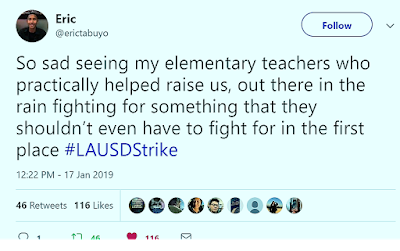 We knew, however, that the loss of 23 teachers due to the 2009 Reduction in Force would have a terrible impact on our school community, and by extension, our test scores. It did. Lamar Queen continues his mission to educate and empower youth via math raps and songs that appeal to our students. His sophomore album is called Second Period and features songs about Pre-Algebra. In addition, the company he founded, Music Notes Online, has also "signed" a second artist, Mr. D, who has released his own album on Geometry. 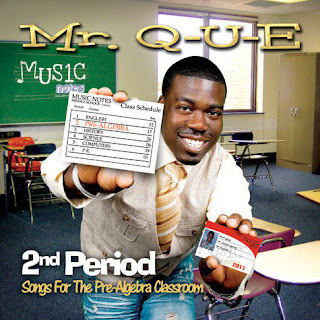 Many fans search this blog for the lyrics to Mr. Q-U-E's raps, and they are finally available online by clicking here. Enjoy! If you are in the Los Angeles area, don't forget to join us at the Back to School Jam at Horace Mann Middle School on September 18th. It's going to be another great year in South Central!